Federal Period furniture pieces are often adorned with a paterae such as this 16-segment oval fan. Here we’ll show you how to make one. Sand shade both long sides using fine uncolored sand from a hobby store, not off the beach. I used a conventional skillet on the gas kitchen stove set to low. 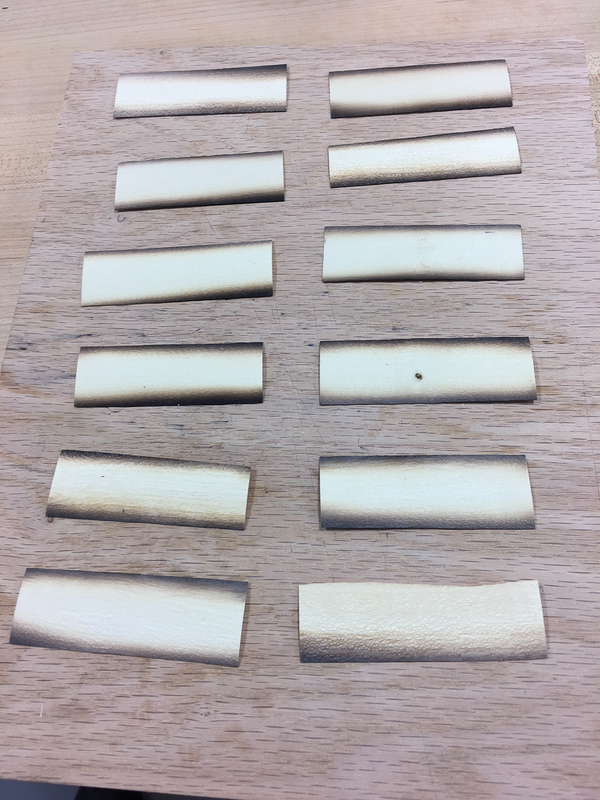 At temp, each piece requires only a couple of minutes to darken. 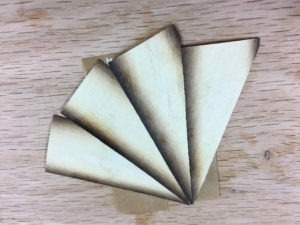 After shading, trim off any burned or uneven edges. 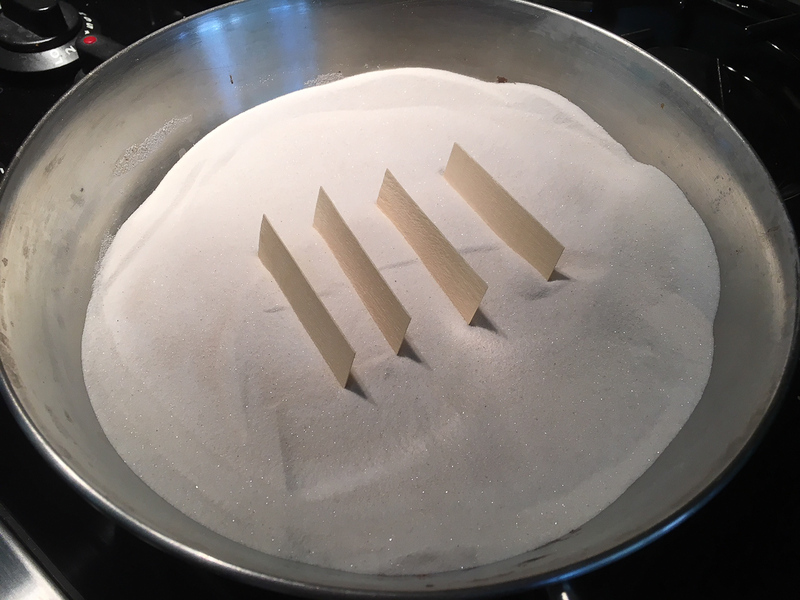 Lightly sand the edges flat. 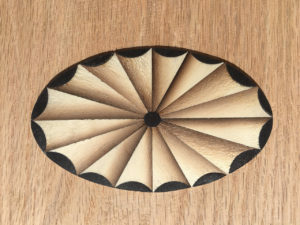 Traditionally, oval fan inlays are laid out such that the perimeter width of all segments are approximately equal. Because an oval is elongated (compared to a circle), the angle of each segment will vary. Our 16-segment oval will have 4 segments per quadrant. 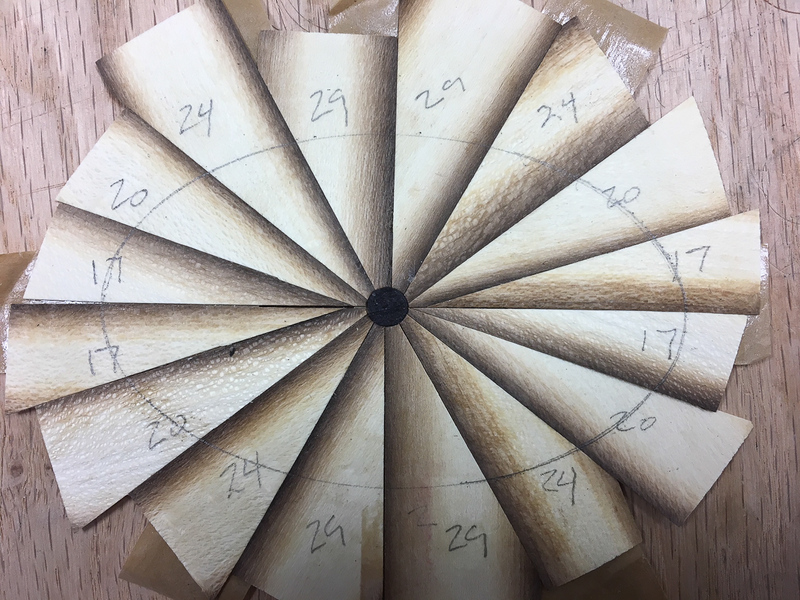 Starting at the longest radius and running to the shortest radius, the angles are: 17, 20, 24, and 29 degrees. See Figure 5 for the recommended angles and layout. 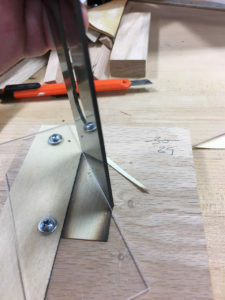 Cut the pie shaped segments using an angle jig, see Figure 3. 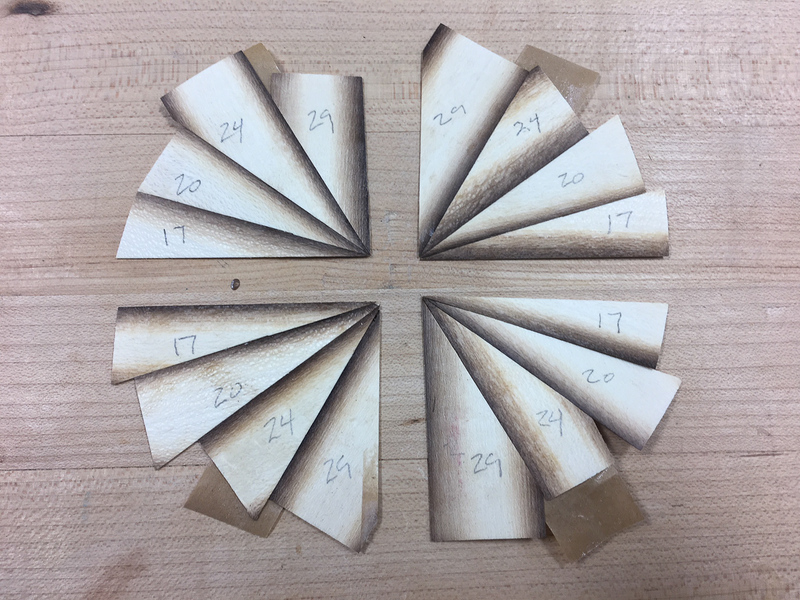 Important: Cut both sides; don’t assume the edges of the veneer stock are parallel. Make a stack for each angle. Assemble each quadrant with veneer tape using one segment of each angle. Two quadrants will be left-handed the other two will be right handed. After assembling each quadrant, lay them out and make sure the shading is on the correct side. See Figure 5. 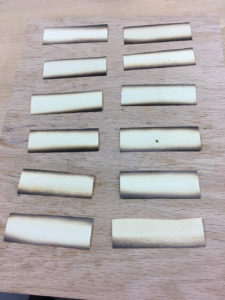 Clamp between two pieces of wood and set aside to dry (wet tape is hard to trim). Then, trim off any tape from the edges. Also, check that each quadrant is 90°. 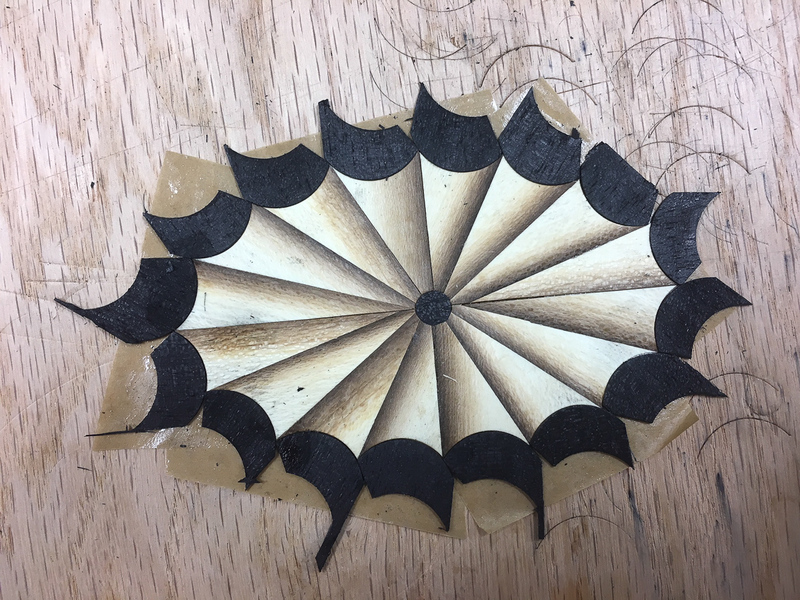 Trim the unshaded edge, if necessary. Assemble the quadrants into halves using veneer tape. Trim each edge of each half with a straight edge. Finally, assemble both halves together to form a complete unit. 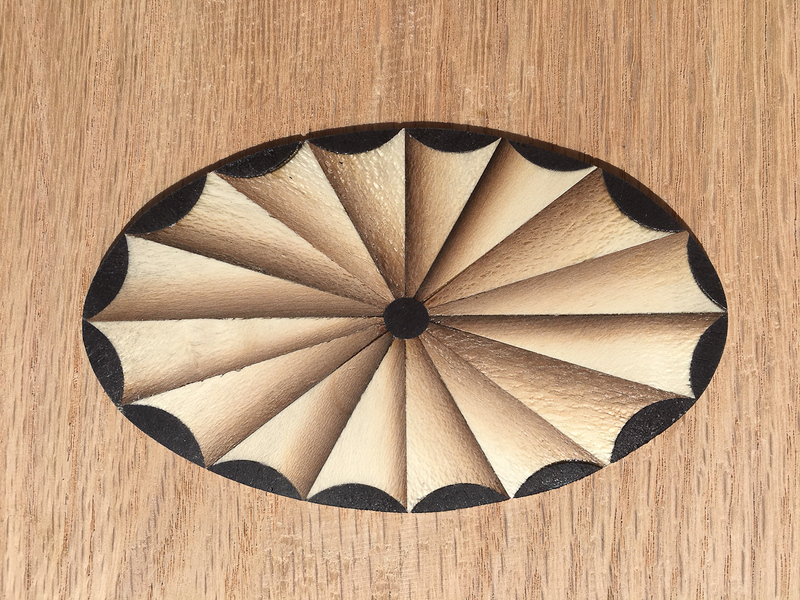 Cut out a circle/oval in the center of the paterae with a #9/7 gouge or hole punch. 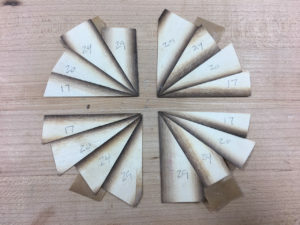 Make an equal size/shape plug from dyed black veneer. Secure with veneer tape. Clamp between two pieces of wood and set aside to dry. 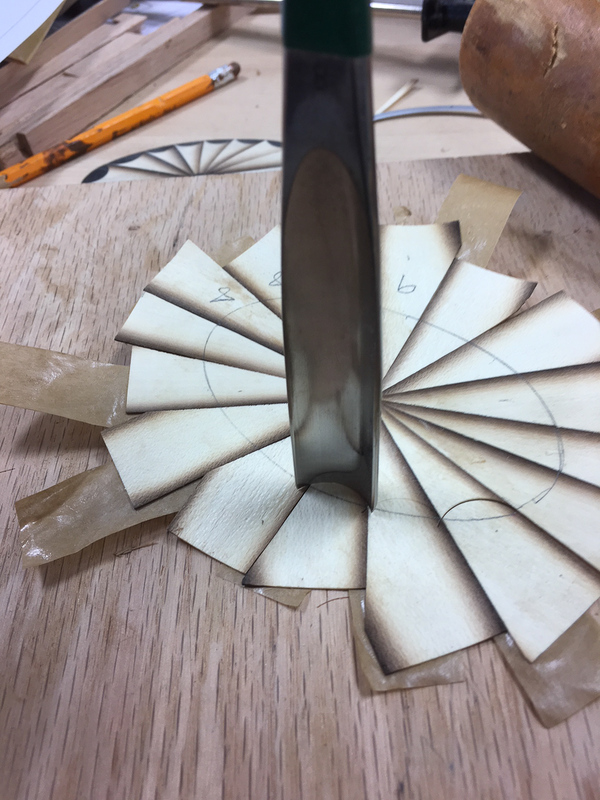 Using an oval template, draw an oval onto the assembly. 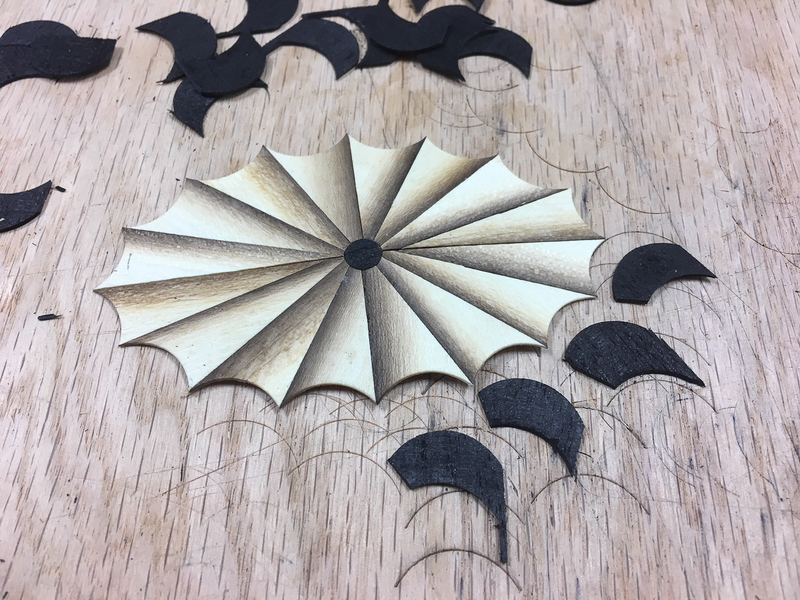 With the #8 gouge, cut-out scallops at the ends of each segment for the background. Align the edge of the gouge with the two point where the edges of the segment intersects the oval pencil line, see figure 7. 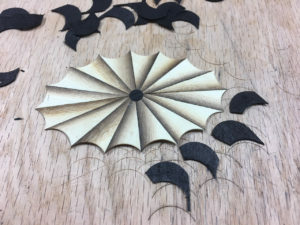 Cut 3/4-inch strips of black veneer (the width of a #8 gouge) for the background. 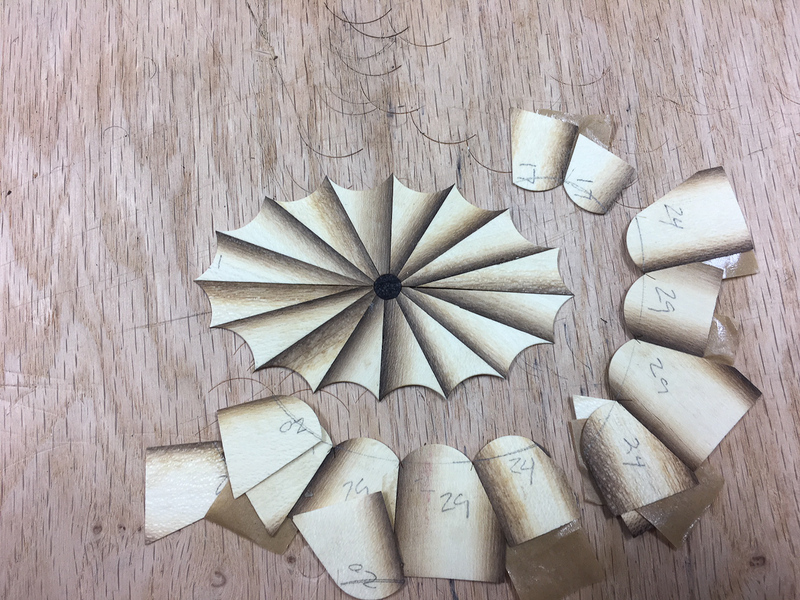 Using the same #8 gouge, cut out thumbnails to fit the scallops cut in the preceding step. To make fitting the thumbnails easier, cut-off one side of the thumbnail as shown in figure 9. 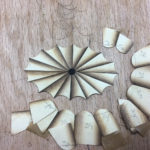 Using veneer tape on the back of the piece, fill each scallop (made in step 2) with a thumbnail (made in step 3) to form a background around the field. Tightly position the thumbnails to the field. Don’t worry if there is a gap between the thumbnails as this will be cut away in a later step. Apply hide glue to the exposed side of the assembly and attached to backer veneer. Cover in aluminum foil and clamp between two blocks of wood until cool (about 20 minutes). Wet veneer tape and remove it. Clamp overnight to fully dry (otherwise it will severely curl). Center oval template on paterae and draw oval outline with a white pencil, see figure 11. 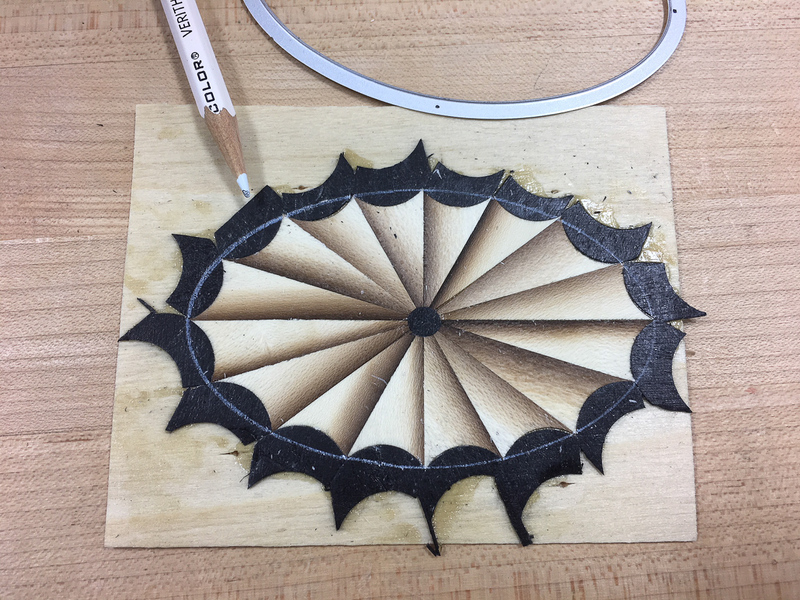 Cut out the paterae on bandsaw using a fine blade cutting just up to the white pencil line. With 220 sandpaper and a block of wood, sand to white pencil marks. Hold the block perpendicular to the surface of the paterae and make curved strokes. Joe is a retired CPA and Sr. IT Data Storage Architect. He resides in Lake Helen, FL with his wife Marie. 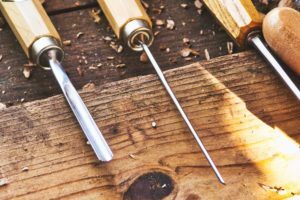 His woodworking interests include cabinetry and building 18th century reproduction furniture. 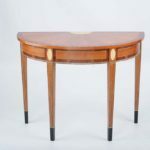 He is also the Florida Chapter President of Society of American Period Furniture Makers. When not making sawdust, he also spends his time building embedded systems with microprocessors, such as Arduino. 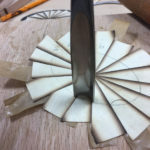 How Did You Learn Woodworking?